There has been a continuing controversy about whether infection with Acinetobacter baumannii increases morbidity and mortality independently of the effect of other confounding factors. We performed a systematic review of matched case-control and cohort studies examining the mortality attributable to infection with or acquisition of A. baumannii (infection or colonization). We included in our review studies that compared mortality and/or morbidity of patients with acquisition of or infection with A. baumannii (cases) with the outcomes of matched patients without A. baumannii isolation from clinical specimens (controls). The relevant studies were identified from searches of the PubMed and the Cochrane Library databases. Two independent reviewers performed the literature search, study selection, and data extraction from nine identified relevant studies. The attributable mortalities, in the hospital and in the intensive care unit, of patients with A. baumannii infection in six matched case-control studies included in our review ranged from 7.8% to 23% and from 10% to 43%, respectively. In addition, a statistically significantly higher mortality was reported for patients with A. baumannii acquisition; that is, colonization or infection (cases) compared with controls without such an acquisition in all four reviewed studies that reported data on this comparison. Although definitive statements about the mortality attributable to the acquisition of A. baumannii cannot be made from the available studies because of their methodological heterogeneity, the reviewed data suggest that infection with or acquisition of A. baumannii seems to be associated with increased mortality. Acinetobacter baumannii is a ubiquitous, non-fermenting, aerobic Gram-negative bacterium with intrinsic resistance to multiple antimicrobial agents [1, 2]. During the past few decades the organism has emerged as an important nosocomial pathogen, affecting mainly severely ill patients in the intensive care unit (ICU) setting worldwide. A. baumannii has been recognized as a leading cause of nosocomial pneumonia and bacteremia (related to central venous catheters or not) in several hospitals in various parts of the world [3–6]. However, there has been a continuing controversy over whether colonization - and, even more importantly, infection – with A. baumannii increase morbidity and mortality independently of the effect of other confounding factors. Although several investigators provided evidence that A. baumannii infections may be associated with considerable mortality [7–10], some of them support the possibility that the clinical course of critically ill patients may be influenced by many variables and that subsequently the acquisition of or infection with A. baumannii may not independently lead to poorer outcomes [11–13]. This controversy has caused considerable confusion among clinicians and investigators about the mortality associated with of A. baumannii infections. We therefore sought to systematically identify and synthesize the available evidence about the mortality attributable to acquisition of or infection with A. baumannii in critically ill patients by retrieving the available data from relevant matched case-control studies. Two independent reviewers (IAB and IIS) performed the literature search, study selection, and data extraction. Any disagreement between the two reviewers was resolved by consensus in meetings of all authors. We searched for studies indexed in the PubMed and Cochrane Library (part of which is also the Cochrane Central Register of Controlled Trials) databases by using the following key terms: 'Acinetobacter', 'mortality', 'colonization', 'case-control', 'match', 'length of stay', and/or 'ICU'. No limits were set in our literature search about the time or language of publication. The references from the identified articles were also searched for relevant publications. Studies included in our systematic review were case-control or matched cohort studies that compared mortality and/or morbidity of patients with acquisition of or infection with A. baumannii (cases) with the outcomes of matched patients without A. baumannii isolation from clinical specimens (controls). We extracted data about the date, setting, and patient population from the studies selected. In addition, the site of infection, the numbers of cases and controls, the methodology for the matching of controls to cases, and clinical outcomes of interest were extracted. The main outcomes that we examined in our systematic review were the crude ICU and/or in-hospital mortality of cases and controls, as well as the mortality attributable to acquisition of or infection with A. baumannii. The mortality attributable to colonization or infection by A. baumannii was determined by subtracting the crude mortality of controls from the crude mortality of cases. In addition, the length of stay in the ICU or in the hospital was reviewed as a secondary outcome. The steps that we followed to select the relevant studies for our analysis are presented in Figure 1. We initially identified 434 potentially relevant studies from the search of the PubMed and Cochrane Library databases as well as from reading the references of relevant studies. In the end there were nine case-control studies (six retrospective [11, 14–18], one prospective , and two with mixed, bi-directional study design, in which cases were studied prospectively but controls were identified from retrospective data review [20, 21]) that compared outcomes in patients colonized or infected with A. baumannii (cases) with those of matched patients from whom A. baumannii were not isolated [11, 14–21]. Flow diagram of reviewed articles. We present the main characteristics of the analyzed studies, as well as the outcomes of our interest in cases with A. baumannii infection and controls, in Table 1. As shown, the infection sites for the cases with A. baumannii infection were the lower respiratory tract (ventilator-associated pneumonia (VAP)) in one study  and blood (primary or secondary bacteremia) in another two studies [14, 18]. In four of the remaining studies both colonization and infection with A. baumannii were described, regardless of the affected site. In the two studies that reported on cases with A. baumannii infection in the bloodstream, the controls might have been infected with A. baumannii but did not have a bloodstream infection with the pathogen. 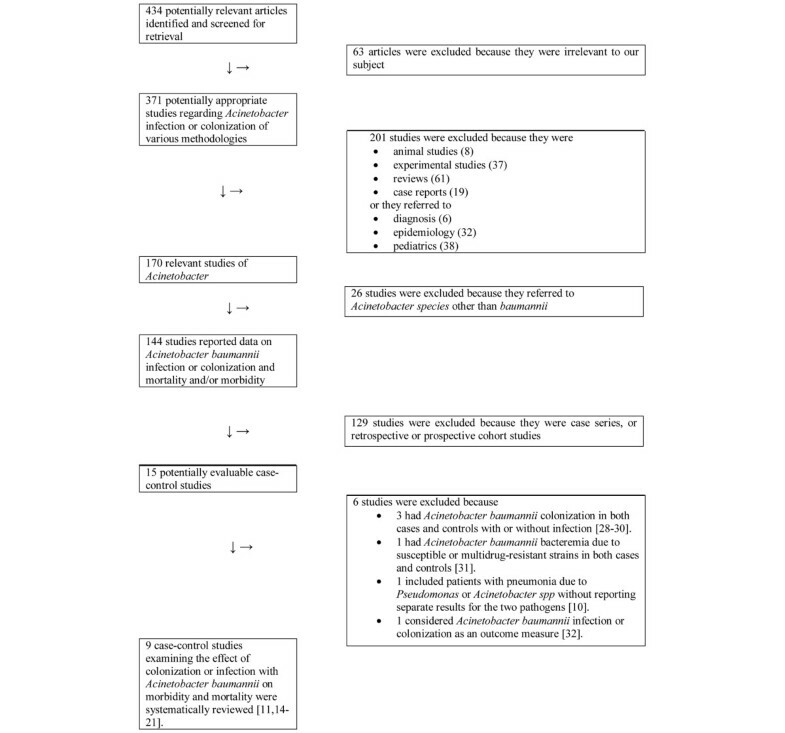 Data on the characteristics of the studies as well as reported outcomes for patients with acquisition (colonization or infection) of A. baumannii and outcomes for controls without A. baumannii acquisition are presented in Table 2. IQR, interquartile range; LOS, length of stay; MDR, multidrug resistant; MICU, medical ICU; NA, non-applicable; NR, not reported; NS, non-significant; VAP, ventilator-associated pneumonia. Acquisition of A. baumannii is defined as patients colonized or infected with the organism; matched controls were those without acquisition of the organism. Ab, Acinetobacter baumannii; APACHE, Acute Physiology and Chronic Health Evaluation; CI, confidence interval; ICU, intensive care unit; IQR, interquartile range; LOS, length of stay; MDR, multidrug resistant; NR, not reported. Four studies reported data on in-hospital mortality in patients infected with A. baumannii, in comparison with controls not infected with the microorganism (Table 1) [11, 14, 15, 18, 20, 21]. In all four studies there was increased mortality in patients infected with A. baumannii in comparison with controls, although the difference was not statistically significant. In one of these studies the mortality difference between the compared groups almost reached statistical significance . The mortality attributable to A. baumannii infection in these studies ranged from 7.8% to 23%. In addition, three studies reported data about the mortality of cases and controls in the ICU [11, 14, 21]. In all three studies mortality in the ICU was higher in patients infected with A. baumannii than in controls. In one of these studies the difference in mortality between cases and controls was statistically significant . Attributable mortality in the ICU ranged from 10% to 43% in the reviewed studies. Four studies reported mortality data in patients with A. baumannii acquisition (colonization or infection with A. baumannii), in comparison with controls who were not colonized nor infected with A. baumannii (Table 1) [16, 17, 20, 21]. In-hospital mortality and mortality in the ICU were reported in three studies [16, 17, 20] and one study  respectively. Interestingly, in all four studies mortality was statistically higher in patients colonized or infected with A. baumannii than in controls. The attributable in-hospital mortality of A. baumannii infection in the three studies that reported on this outcome ranged from 16% to 27%, whereas in the other study the attributable mortality in the ICU was 30%. It is noteworthy that two of these four studies did not match the patients for disease severity [16, 17]. Five out of seven studies that reported data on mortality in patients infected with A. baumannii (Table 1) also provided data on the length of stay of cases and controls in the ICU [11, 14, 17, 18, 21]. In three of these five studies a statistically significant increase in the length of stay in the ICU was reported for the cases with A. baumannii infection [14, 17, 21], whereas in the remaining two studies no significant difference was found in the length of stay in the ICU between cases and controls. Data on the length of stay of cases and controls in the ICU was reported in all five studies that examined the effect of acquisition (colonization or infection) of A. baumannii (Table 2). A statistically significant increase in the length of ICU stay was noted in four of these five studies for patients who were colonized or infected with A. baumannii (cases) in comparison with patients from whom this bacterium was not isolated (controls) [16, 17, 20, 21] (no statistical data on the comparison of this outcome in the studied population were reported in the remaining study ). The attributable mortalities, in hospital and in the ICU, of patients with A. baumannii infection in the reviewed matched case-control and cohort studies ranged from 7.8% to 23% and from 10% to 43%, respectively. It should be emphasized that all studies that examined mortality of patients (cases) with A. baumannii acquisition (colonization or infection) compared with controls without such an acquisition found statistically significant differences; that is, higher mortality in cases than in controls, although a causative role for the isolate on the mortality cannot be directly inferred from these data. In addition, no matching of patients and controls for disease severity was made in two of these studies [16, 17]. Further, the length of stay in the ICU was found to be statistically significantly increased in patients with A. baumannii infection in three of five studies examining this outcome. The increase in mortality of patients with infection or acquisition of Acinetobacter in comparison with matched controls without colonization or infection, noted in the studies included in the systematic review, is supported by evidence provided by several retrospective and prospective cohort studies examining this issue. For example, Kollef and colleagues  found that VAP due to non-fermentative Gram-negative pathogens was independently associated with increased mortality in hospital, with an associated mortality rate of 65%. In that study the occurrence of late-onset VAP due to non-fermentative Gram-negative pathogens was the most important predictor of hospital mortality in patients developing VAP (adjusted odds ratio 5.4; 95% confidence interval 2.8 to 10.3; p = 0.009). In addition, Garrouste-Orgeas and colleagues , in a 1-year prospective observational survey, evaluated the clinical effect of salivary or rectal carriage of multi-resistant Acinetobacter baumannii and/ or Klebsiella pneumoniae in patients hospitalized in an ICU. Of 265 patients, 88 (33%) developed oropharyngeal and/or rectal carriage. Mortality was significantly greater in the carrier group (43% versus 25%, p < 0.001). Stratification of patients showed that, although abnormal carriage was found in the most severely ill patients, it mainly influenced mortality in the less severely ill. Finally, Wisplinghoff and colleagues , reported results from the SCOPE (Surveillance and Control of Pathogens of Epidemiologic Importance) project, a prospective study with 49 participating hospitals in the USA. The authors reported that the mortality of patients with 111 bloodstream infections caused by A. baumannii was not significantly different from that of 2,952 patients with bloodstream infections due to other Gram-negative pathogens (35/111 patients with A. baumannii died (31.5%) compared with 821/2,952 patients with other Gram-negative pathogens (27.9%)). This study provided strong evidence in support of the position that A. baumannii bacteremias are as severe as other Gram-negative bacteremias and thus may result in considerable mortality. Some of the investigators studying patients with A. baumannii infections concluded that mortality in these patients was not independently associated with these infections. In two studies by Garnacho-Montero and colleagues [11, 25], one of which was included in our review, the authors suggested that VAP due to A. baumannii was not associated with a poorer prognosis than other causes of VAP. In addition, Weingarten and colleagues , in another study included in our review, suggested that colonization or infection with A. baumannii is not associated with increased mortality, but instead that the severity of the illness of cases and controls is the major determinant of mortality. Finally, Sofianou and colleagues , in a prospective cohort study examining the incidence, risk factors and pathogens of VAP, concluded that the occurrence of VAP, regardless of the microbiological etiology, was not associated with higher mortality in 198 ICU patients. However, this finding was in disagreement with those from other studies, including that of Fagon and colleagues , in which mortality was higher in cases with VAP caused by A. baumannii and P. aeruginosa than in controls with bronchial colonization with these pathogens. Although the aforementioned studies attempted to unravel the prognostic importance of colonization or infection with A. baumannii, the disagreement between their results create difficulties in deriving definitive conclusions about the severity of disease that results from this organism. The fact that the organism is often resistant to multiple antimicrobial agents, making it difficult to provide appropriate antibiotic therapy, and also the fact that it affects critically ill patients, make the answer of the above question of crucial importance for clinicians worldwide. Our systematic review has several limitations. First, we selected for inclusion only matched case-control and cohort studies in our attempt to provide data from comparative studies with analytical methodology. However, it should be noted that different matching criteria were used in the studies included in our review and also that some studies did not take into account the severity of disease as a matching criterion. Second, no specific analysis was provided in the reviewed studies about the effect of colonization or infection of A. baumannii with various phenotypes (in vitro susceptibility pattern to various antibiotics) . Third, we could not pool the data by using the techniques of meta-analysis because there was considerable heterogeneity in the sites of infections, the populations studied, and, most importantly, matching criteria between the studies. However, although no statistically significant differences were found in the comparison of mortality between patients with Acinetobacter infection (cases) and controls without such infection it should be noted that this outcome is probably due to the small sample sizes in the studies included in our systematic review. Thus, either more homogeneous data from studies that would allow a meta-analysis or larger studies with enough power could offer a definite answer to our research question. Last, we did not evaluate the effect of A. baumannii infection at various body sites and systems such as pneumonia and bacteremia on mortality. The evidence from the reviewed matched case-control and cohort studies examining the mortality of patients with colonization or infection with A. baumannii suggests that such colonization and infection might be associated with considerably increased mortality. It should be emphasized that to attribute the difference in mortality between cases and controls directly to colonization or infection with Acinetobacter (attributable mortality) is more than a simplified approach to this complex issue. This is because the reviewed studies did not and could not match for other factors that might have made important contributions to mortality. Despite these shortcomings, our systematic review lends support to the idea that A. baumannii infections are associated with considerable morbidity and mortality, and clinicians should therefore make every effort to combat them. There has been controversy over whether colonization and infection with A. baumannii increase morbidity and mortality independently of other factors. The attributable mortality, in hospital and in the ICU, of patients with A. baumannii infection in six matched case-control studies included in our review ranged from 7.8% to 23% and from 10% to 43%, respectively. Statistically significantly higher mortality was reported for patients with A. baumannii acquisition; that is, colonization or infection (cases) compared with controls without such an acquisition in all four reviewed studies that reported data on this comparison. Definitive statements cannot be made about the attributable mortality of acquisition of A. baumannii from the analysis of the results from the reviewed studies because of their methodological heterogeneity. MEF had the idea, designed and supervised the study, and is the guarantor. IIS and IAB performed the literature search, identified the relevant studies to be included in the analysis, and extracted the data for the study. MEF and IAB wrote a first version of the manuscript. All authors made substantial revisions of the manuscript and approved its final version.